a. Any nationality is allowed to start and compete on an EFPT Event. Only Riders with a valid passport from a European country are eligible to win the EFPT title. c. All EFPT registered riders with valid mail addresses will receive an invitation mail 6 weeks before of every event. d. Pre-registration ends 2 weeks before the event. e. Riders who want to register after the pre-registration deadline will be charged 150% of the registration fee. f. All pre-registered riders have to confirm their presence personally or through a representative to the race director until the end of the registration on site. The registration fee has to be paid in cash to the local organiser at the registration on site. g. Only production equipment by brands in the EFPT sponsor pool may be used at an EFPT event. Equipment by non pool sponsors will not get any coverage by the EFPT media team. Custom equipment is not allowed. All EFPT pool members are displayed on efpt.net. h. The EFPT will charge a membership fee for every rider who competes. The membership fee for the season is € 80,-. If the rider only participates in one event 50% of the amount will be charged. If a sailor is attending two or more events the whole amount is due on the second event. If a rider participates for the first time in an official EFPT event a rookie fee of € 20,- for the first event will be charged. a. The seeding will be done by the EFPT crew on site after the registration at the event. b. The size of the fleet depends on local conditions and can vary from 16 to 48 riders. A qualification event is optional. If there is no qualification, the seeding shall be done by the current EFPT seeding list. d. The seeding of the sailors at each EFPT event shall be based on their position on the current EFPT seeding list. The end ranking of the previous season will be counted as a single event result of the highest prize-money of the running season and will be kept into the actual seeding list till the end of the current season. e. The PWA freestyle ranking list will be taken into account only if a sailor wants to start at an EFPT event but does not appear on the current EFPT seeding list or if his actual EFPT seeding does not correspond to his PWA ranking at all. g. For example PWA Ranking# 7 corresponds to EFPT seeding# 5.
h. In case that a rider shows a better EFPT seeding than PWA Ranking the EFPT seeding has priority. If a rider does not show EFPT seeding nor PWA ranking points it is up to the local organiser in cooperation with an EFPT official to announce a wild card. i. 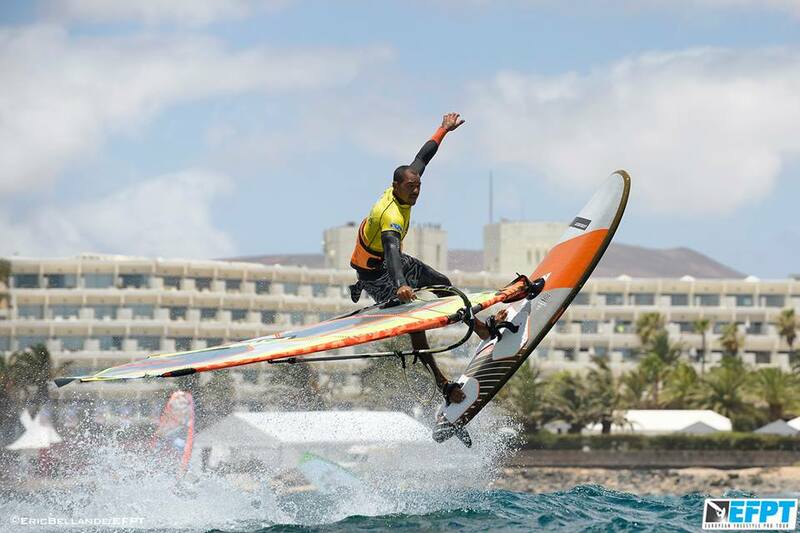 After the first EFPT event a PWA rider takes part the result of the event as well as his last years PWA ranking will be considered for all upcoming of the season. In case that after an event a EFPT rider shows the same seeding points as a PWA rider the EFPT rider will get the priority in the next seeding. In case that at an event an EFPT rider has the same seeding like a PWA rider, the EFPT rider will get priority. j. The top 16 riders of the current EFPT ranking list will always be seeded as far as they pre-register for an event. k. The number of wildcards and places for qualifiers will be announced by the EFPT in collaboration with the local event organiser at least 4 weeks before the event. c. Only jumping moves are counted. Only moves within the heat area, marked by buoys, are counted. Heat duration and further circumstances will be announced during the skippers meeting at the events. Conditions have to be suitable for the applied competition format. Whenever on the water riders have to wear the event lycra and have to have event and EFPT stickers placed visible in their sails. a. The judging team has to consist of 6 judges with a minimum of 2 EFPT approved judges at 5.000 € prize-money events and a minimum of 4 EFPT approved judges at 10.000 € or higher prize-money events. b. The race director always has to be approved by the EFPT. c. Jury decision are decision based on facts. The head judge may give riders insight into their scoring sheets. a. The first riders meeting and the registration at the event is announced in the event details online on efpt.net for every single event. During the registration the further schedule for the event will be announced by the race director and displayed on the official event noticeboard. b. Riders have to be present at public events set either by the EFPT or the event organiser and listed on the official noticeboard. If a rider misses an event he will be charged € 50,-. The EFPT reserves to deduct the penalty fee from the prize-money of the penalised rider. a. The level of prize-money determines the level of points for the overall title. b. The number of sailors will not be taken into calculation of the factor. If there are more than 3 events in a season, 1 event will be discarded. If there are more than 6 events in the season, 2 events will be discarded. If there are more than 9 events, 3 events will be discarded. c. Events are classified by 1 to 5 star events according to the amount of prize-money and ranking points to be gained. If there is no result due to bad conditions all participating riders will get 15 points for showing up at the event. d. 10% of the prize-money goes into the overall pot of the season. The remaining amount will be disbursed according to the prize-money split. e. The prize-money will be disbursed at the prize giving ceremony, to receive the prize-money riders have to be present at the prize giving ceremony of the event. f. The overall prize-money will be disbursed on the final event, to receive the prize-money riders have to be present at the final event. If a rider who would receive overall prize money can not be present at the final event on health reasons he has to send a medical certificate to the EFPT and the prize-money will be transferred after the event.